Time to report in on blocks you made in August! And in spite of myself, I managed to make 15 blocks. I fell one short of the August goal, with a grand total of 229. No worries — I can catch up! Here’s what a few of them were . . . I made these two tiny blocks from trimmings left over from making scrappy binding for a quilt. I can’t bear to throw anything away — it’s a bit of a sickness, really — but still, it makes me happy that these pieces that might have ended up in the trash will now be in a quilt instead. I made this block for my friend, Jean, in our guild. She asked for a black and white star with any color background. 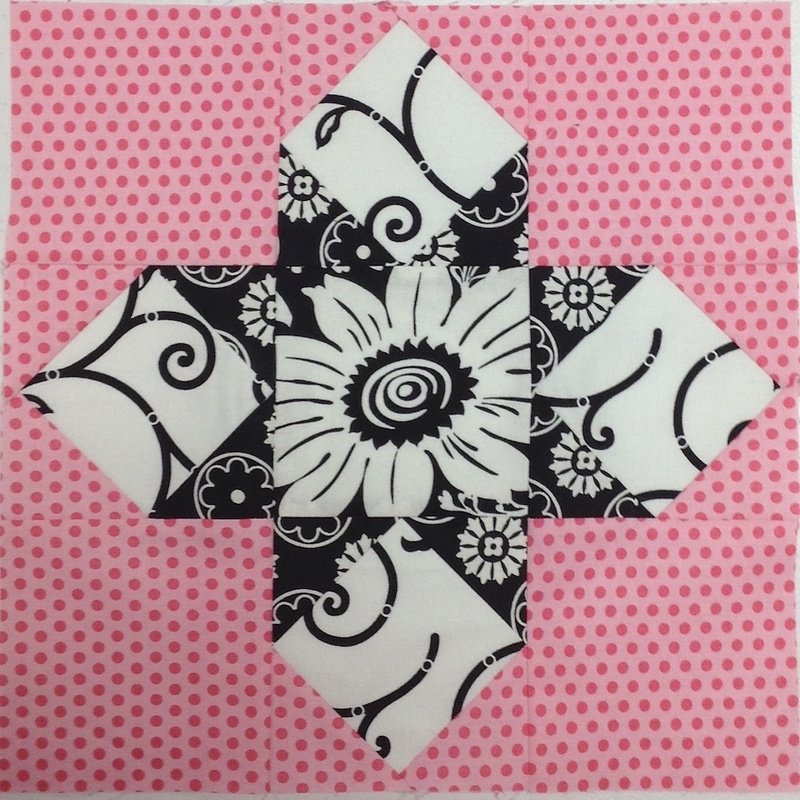 I chose the Brasstown Star block pattern from Quilter’s Cache to make this one. 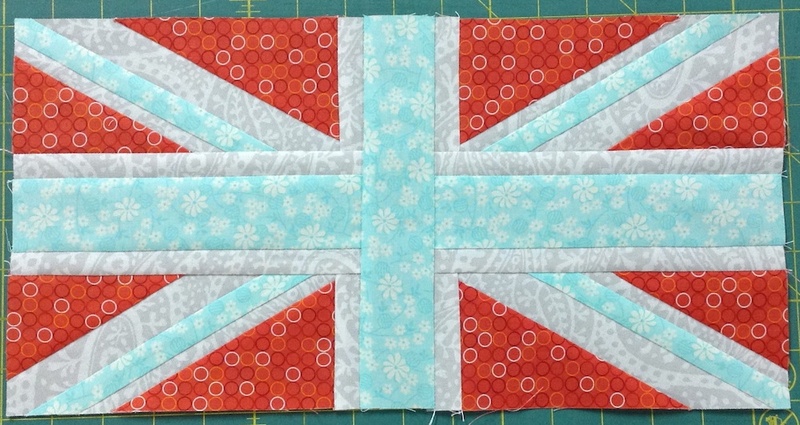 For my Sew Sisters Quilting Bee, I made this Union Jack block for Mary on Lake Pulaski. I also made an extra one for myself. To read more about it and get the free tutorial, click HERE. I also made the rest of the blocks for some quilts I’ll show you tomorrow, and one block to contribute to a Quilt of Valor that Norma from guild is coordinating. A fairly productive month — now if I could just have a few more of those! Leave me a comment or contact me with your updated totals. We’re fast closing in on the end of 2015 — can you believe how fast it’s approaching? I’ve updated the Project page with all the current participant totals, and the new goal for this month. Another 30 blocks for a year-to-date total of 260 by the end of September. Some of you have already gotten there, so I know the rest of us can do it. The July prize winner is: Julie S.
Have a wonderful stitchy month — I have a lot to get done, so I hope to have plenty to show for September’s report — I hope all of you will, too! I have completed 7 blocks. The packers are unloading right now at our home here in Texas. I am at daughter’s home so have computer access. I will be lucky if I get much sewing done in September. This too will pass. My perimeter is 8919 for the year. I, too, had a very busy month what with traveling and hanging out with DGKs. But in the last 10 days got busy and made 31 blocks. You can see them here: http://tinyurl.com/q5zzbpa in the last three quilt tops of that post. Thank you for encouraging us to do what we love – piece and quilt. August block count: 138 blocks. Give me 32…but I feel like I am running in place! It was a busy month here too, but I spent most of the month finishing quilts and working on blocks for challenge quilt. I had a total of 90 blocks this month. Now to finish the guild challenge quilt by September 16th. I made another 144 blocks and it is now a quilt top, bringing my total for the year to 564 and a screeching halt for a while. 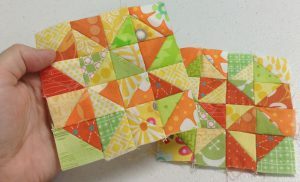 I have 12 quilts I need to get quilted by the end of the year and all are tops except 3 – one the blocks are made and I’m quilting it as I go, one most if not all of the blocks are make and I need to assemble it QAYG style. The 3rd one is still in pieces, but I want to get a few of the quilts quilted before I work on it again. A busy August here too, giving me only 2 blocks completed for the month. But I did get a new granddaughter, so it’s all ok.
103.. working on a couple of quilts for me. finished a couple of quilts. plus a couple of bees. Well not very productive as far as blocks go. I made 15 blocks in August for a ytd of 462. I did however finish two quilts and a few other small projects. So all is good. I had 97, thanks in part to our awesome retreat! Your little blocks are adorable! What a great use of your scraps. I made 4 blocks this year, giving me a total of 346. Onto September! I got 32 done this month. 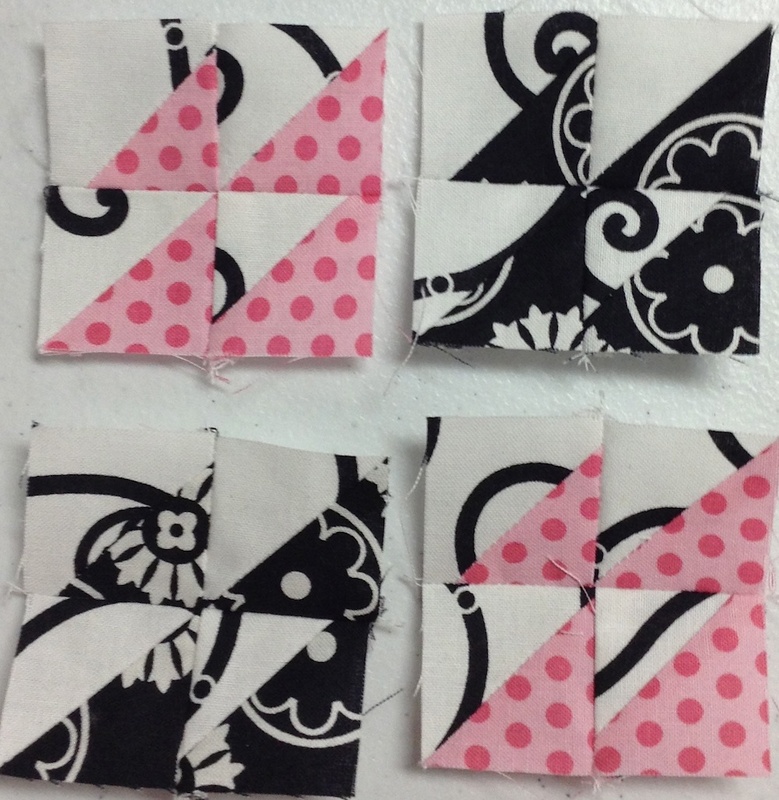 Now I need to get busy finishing some of these quilts that I’ve made the blocks for! 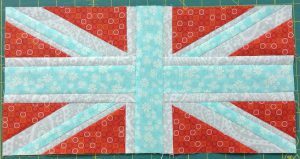 Add another 52 to my total….the frenzy of piecing has slowed a bit! I am happy to say I got 76 blocks done during August but I think September total may beat August if I can make my deadlines. A lot more sewing needs to be done. I did 18 Leader/Ender blocks and 20 from a lighthouse themed quilt. A Total of 38. I am making a come back. I did 83. I have the front and back ready to be sandwiched for a king size quilt for my daughter. Now I just need to get it to the long arm quilter. Need to have it done by the end of September. Been extremely busy with the garden, canning, and life itself. Now I go to classes on Wednesday nights for 3 hours. Lots of homework. I am also teaching my hubby how to quilt. He has made a full size quilt and it is also ready for the quilter. He has really surprised me in his understanding of how to do quilting. I have a quilting buddy. Yeah. 33 blocks this month. 299 for the year…getting there! I did 56 blocks this month making my total 208. I have 133 new blocks for a total of 937! 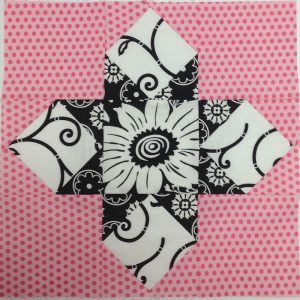 I made 63 blocks for August. I don’t remember if I posted my block #’s for July where do I find those totals? I made 107 blocks in Augsut. My total now is 503. Being retired has really made a difference in my amout of sewing time I have. I am making new quilts, finishing UFO’s and using my scraps. Do you think one day soon all my stash will be sewn up? Nay just wishful thinking. I managed 29 blocks in August which made a baby quilt top. Now I just have to get it quilted before the baby arrives. Only got 62 done this month. Because I had to make 120 4-patches, I managed to make a grand total of 128 blocks this month. And I know it doesn’t count as a block, but I quilted a panel for my new great-grandbaby. Just had to brag about that. Can I get a prize for that?? I had a big month–185 blocks for August, bringing my total to 992 for the year! I had a great month and finished a ton of stuff–one quilt completed and another top almost finished, plus a bunch of gifts made and delivered. Thanks to the nightly Cardinal baseball games, I am in my studio every evening to sew and watch the game for at least two hours. I love it–I get so much done AND I get to watch the game! Didn’t keep up with the new pace I’d set the last few months, mostly because I’ve been trying to finish quilt tops and quilts. Happy to be making progress in sewing, whatever it is! Forgot to mention I love all your scrappy little blocks. I used to save every tiny triangle, no matter how small, so I know what an accomplishment it is to make a quilt from those little scraps! I love your tiny bright blocks from the binding scraps! This month I completed 33 blocks for a total of 743. Not a productive month block wise, but certainly was from a completion perspective. I made 20 blocks in August. August total – 42 blocks. Almost forgot to report. I was gone on vacation. I managed to do 20 blocks. I’ve been a slacker this month. My excuse is a vacation and machine quilting two quilts. I can only add 6 blocks to my total.